We’ve seen the Chevy Bolt (not just seen, driven!) so, in March, it is Tesla’s turn to unveil its $30,000 long-range electric car. We’ve had a steady stream of whispers on the Model 3 but are unable to verify much of what we’ve heard. The biggest tidbit I’ve heard from a second-hand source is that Tesla is readying at least 2 different versions of its Model 3 for the March launch. One version is a sedan and another is a small crossover built on the same platform. I can’t verify if the crossover is the Model Y that Elon Musk mentioned in a Tweetstorm last year, but that would make some sense. We’ve heard that this vehicle will be a smaller version of the Model X with its Falcon Wing doors. Again, it will have a premium price over the Model 3 similar to the $5,000 difference between the Model X and Model S.
I decided to hold off on publishing this info until I saw Tesla’s Hong Kong presentation this week, which included two cars under wraps (pictured above). Yes, obviously, the artwork is simply a Model X and Model S under digital covers, but the fact that there are two cars to be unveiled adds a little more credence to what I’ve heard. 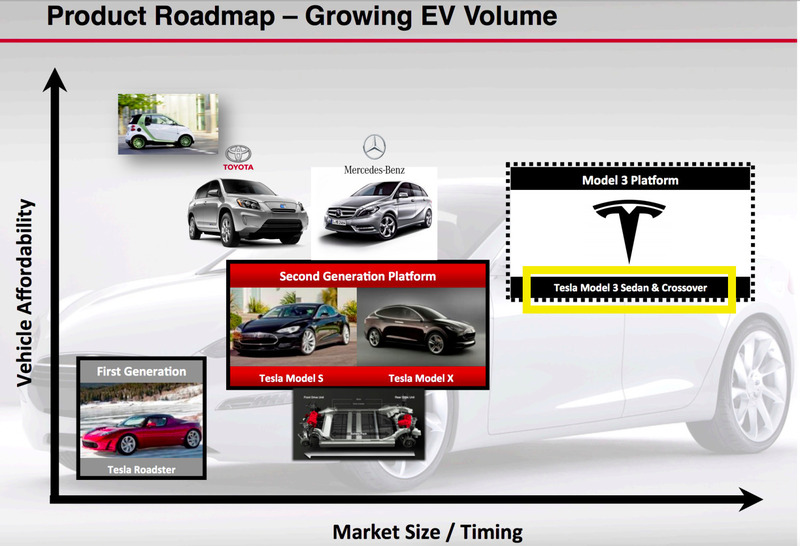 We broke the news in March of 2014 that the Model 3 platform would be more than just a sedan with the leaked slide presentation below which first mentions “Crossover”. My source believes that the plan around Christmas of last year was to launch at least two vehicles or configurations at the same time, but obviously things could change. Also, Tesla could have two projects happening simultaneously to contain/isolate leaks. We know the car is going to cost around $35,000 without federal subsidies so after (including some state subsidies), it could cost significantly less than the $30,000 Bolt. The base model will likely be a 2WD version, but I think the most popular, better specced model will have AWD at a $3000-$4000 premium (it is a $5000 premium on the Model S). Battery size: I think Tesla needs to beat GM’s range but can do it with the same amount of battery — so something around the same 60kWh on the base model should get Tesla to 240 miles with low drag, light aluminum body, efficient motors and regeneration. There will also likely be a long-range battery which could be as high as 80kWh or eventually 90kWh. Superchargers? A big cost savings will be supercharging at a fee. Rather than include “free supercharging for life” like Tesla does with its Model S and X vehicles (it was originally a $2500 option), I think Tesla will want to associate a credit card with the car and automatically charge on an as-needed basis. These prices will still be less than gas but probably be more than the local electric company charges for electricity on a kWh basis to pay for infrastructure/overhead. CEO Elon Musk wants to scale solar to all of its chargers which could offset some of the costs. Some people will never use Supercharging. Some with extraordinarily long commutes could use it every day. Cabin Size: Musk has made numerous comparisons to the BMW 3 series and that sounds about right here. I think with Tesla’s revolutionary and often-copied skateboard battery body, this is going to leave a lot of room for cargo or perhaps extra seating, especially in a crossover version. Will Tesla try to squeeze a third row in? I’d say more likely than not, especially on the crossover option. I have to believe Tesla will continue with its “frunk” storage under-the-front-hood model because it not only adds storage space but creates the crumple zone that makes Teslas the safest cars on the road. Dashboard: I believe that Tesla will add the huge display to its cheaper-priced Model 3 and Model Y. The cost of designing a new, less costly middle stack far outweighs the OEM cost of a 1080p capacitive touch display. In fact, since it is already invented and its parts are cheap, the 1080p touch display might even save money over traditional middle stacks. Delivery: If Tesla follows their current pattern, and there is no reason to believe that they won’t, they will begin shipping higher end varieties of the Model 3 to the first reservation holders at the currently scheduled end of 2017. From there, a wider rollout of base model vehicles will hit the road in 2018 as production ramps. We’re two short months away from Tesla revealing the Model 3, and we hope to have more information to share with you soon.